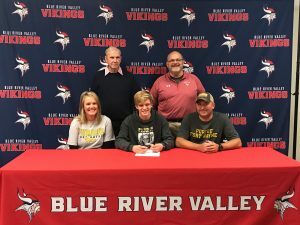 Andrew Whitinger recently signed his National Letter of Intent to run Cross Country and Track for the Purdue Fort Wayne Mastodons. Andrew was a 4 time Semi-State Qualifier as well as Honorable Mention, and Academic All State Honorable Mention while running for the Vikings. Pictured here with Andrew are his parents, Kelly and Dave Whitinger as well as Coach Paul Harper and Athletic Director Steve Hoskins.